Locre, Belgium. 8 March 1918. 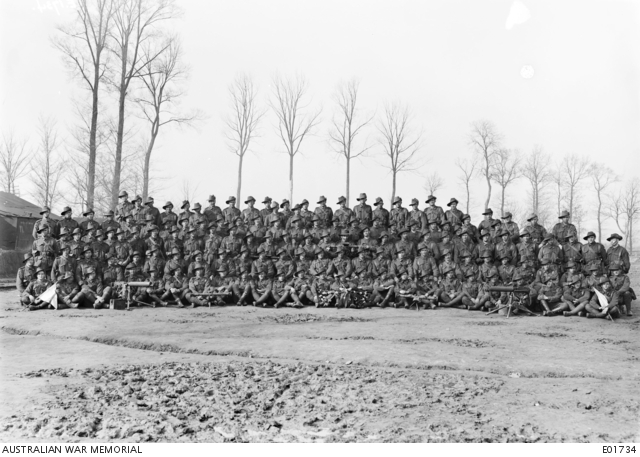 Group portrait of the 24th Machine Gun Company. Left to right, back row: 435B Sergeant (Sgt) P. Corbey Croix de Guerre; 577 Driver (Dvr) D. D. McLennan; 421 Dvr E. Nicholl; 377 Dvr E. J. Ryan; 4000 Dvr B. M. Alsop; 510A Dvr R. M. Gordon; 418A Dvr H. V. C. Marriner; 417B Corporal (Cpl) W. G. Dunbar; 541 Cpl H. G. Foster; 411A Private (Pte) E. Arkle; 650A Pte E. V. Tonks; 647 Pte T. Pithers; 382 Lance Corporal (LCpl) H. B. Stuart; 3163 Pte D. J. Gill; 603A Pte W. Wrigley; 595 Pte A. G. Simmons; 7332 Pte Ernest Allen Yde; 682 Pte W. Hackett; 496 Pte A. W. Hukins; 597 Pte J. W. Harper; 591A Pte H. Kitley; 636 Pte V. M. A. Hunt. Fourth row: 413D Dvr E. Cox; 459B Dvr H. W. Cooke; 416A Dvr H. H. Dunbar; 437 Dvr G. F. Pardon; 493 Dvr J. C. Ryan; 367 Dvr K. Lynn; 420 Dvr G. J. Newson; 419A Dvr W. Munro; 457A Dvr C. R. E. Woods; 468B Pte C. F. Pearce; 455 Dvr A. S. Werrett; 7206 Pte J. I. Blaikie; 582 Pte A. W. Birrell; 603 Pte H. M. Green; 590 Pte J. Harper; 588 Pte L. R. Perry; 652A Pte A. E. Waldon; 828 Pte S. E. Heath; 565 LCpl O. S. Johnson; 590A Pte W. F. Purves; 600 Pte R. F. Weston; 2600 Pte V. Dyson (standing slightly back in row); 432 Pte V. F. Druce (standing forward in row); 468 Pte R. C. Ruschpler (standing back); 431A Pte A. H. Sellars; 472A Pte R. J. Stanwix (standing forward in row); 680 Pte W. H. Gibson; 688 Pte J. Smith; 472A LCpl J. Stewart. Third row: 150 Pte M. P. Vernon; 3937 LCpl W. H. S. Pearce; 432C LCpl J. C. Capern; 656 Pte A. G. Parish; 4737 Cpl W. A. G. Keneally; 602 Cpl C. H. Brindle; 514A Sgt J. Links, Artificer; 386 Pte H. C. Howard; 510 Cpl J. A. Houslar; .